Ellis Hall onstage with the Perkins student chorus. 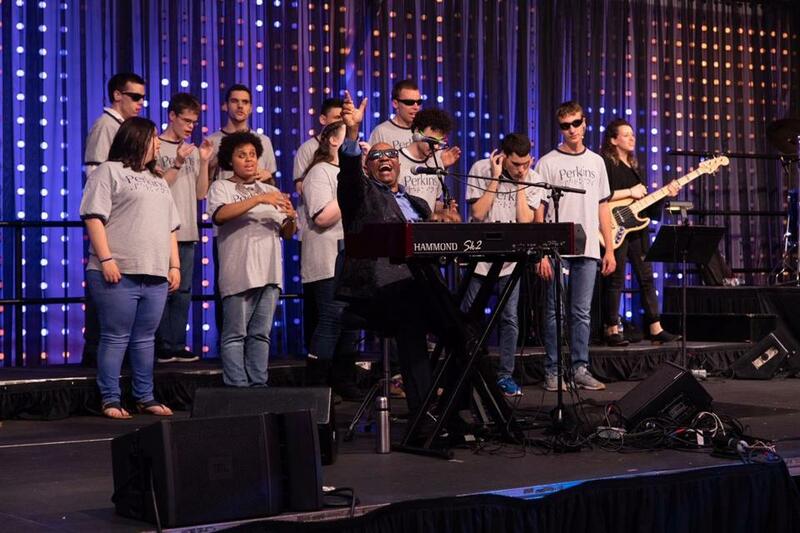 Ellis Hall , a protege of the late, great soul singer Ray Charles , provided the entertainment at the 13th annual Perkins Possibilities Gala. Hall, an alum of the Perkins School for the Blind, performed alongside the Perkins Chorus and a band from Berklee College of Music. More than 500 people attended the event at the school’s Watertown campus Thursday night. The gala raised more than $1 million to support programs and services for people who are blind. Comedian Lenny Clarke took up the role as gala auctioneer. Perkins Board of Trustees chair Corinne Basler Grousbeck and Perkins president and CEO Dave Power both spoke at the event. Notable guests included Kevin Bright, executive producer of NBC’s “Friends” and a longtime producer of the gala, and his wife, Claudia; Tom DiBenedetto , a partner in the Fenway Sports Group, and his wife, Linda ; Jackie Liebergott , former president of Emerson College; Hunt Lambert, Perkins board member and dean of the Harvard Extension School; developer Steve Samuels ; Spaulding Rehab Network president David Storto with senior vice president Oswald Mondejar; Putnam Investments president Bob Reynolds and his wife, Laura; Simone Winston of Winston Flowers; and Kennedy Elsey of Mix 104.1 radio.